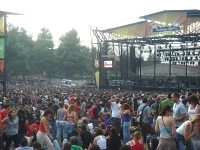 Since its inception in 1996, Athens' Rockwave Festival has become one of Europe's most popular live-rock-music events. The annual festival continues to draw the hottest performers and an enthusiastic crowd of tens of thousands. The festival takes place over three days, and features three stages offering metal, rock and dance music respectively. Past performers include big names such as Ozzy Osbourne, The Prodigy and Machine Head. The festival is well-organised, with kiosks that work as meeting points, bulletin boards and helpful staff on permanent duty. Fans will find first-aid stations plus loads of food and drink options. The festival uses a coupon system rather than cash, though. Sponsors run leisure areas where there are games and activities. The venue is in the Malakasa area, which is known for its natural scenic splendour. It's also a protected environment, so fans are urged to avoid littering, and to respect the natural surroundings.